The Motor City Horse Force is bringing even more horsepower to town. 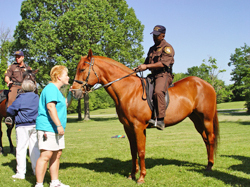 This nonprofit foundation has come together to support the Metro Detroit Mounted Police Units. Our group’s mission is to preserve and expand the Mounted Units for public safety in Southeastern Michigan. To accomplish this mission, the Horse Force needs your help. While you’re here, explore the history of the units and meet the officers and horses that make up the force. Check out photographs of recent fun events and learn about upcoming events. Get info on how an office and horse can be at your event or school. Learn about the advantages of mounted officers and how you can get involved. Show your support by offering a financial pledge. The Motor City Horse Force. For a Safer Community.